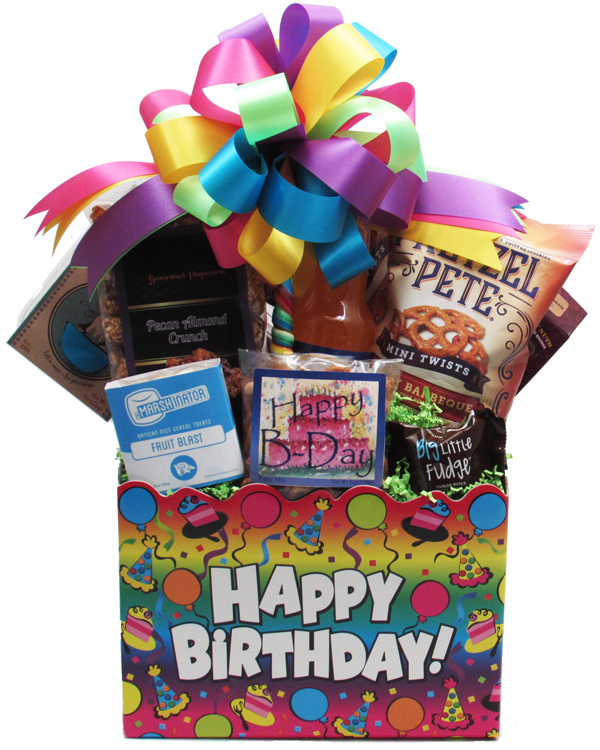 Lots of color goes into this birthday design .....blues, greens, purples, yellows, maroon, and more! This Happy Birthday themed container has lots of graphics of balloons, confetti, slices of birthday cake, and party hats! Wrapped in crisp clear Cellophane and topped off with a colorful Handmade Bow. Includes a Handwritten Greeting Card. Add Balloons for $2 each and/or a plush animal or specialty photo frame to really make an impression! Filled full with Creamy Dark Chocolate filled Wafer Cookie, White Chocolate Amaretto filled Wafer Cookie, "Happy B-Day" Snack Mix, Big Little Fudge Bite, Strawberry Banana Spiral Lollipop, gourmet Popcorn (Almond Pecan Crunch, Dark Chocolate with Sea Salt Crunch, Cranberry Walnut Crunch, or Caramel & Cheddar Crunch), Dublin premium Soda (Orange Dream, Root Beer, or Vanilla Cream all made with pure cane sugar), Pretzel Twists (Smoky Barbecue, Salted Caramel, or Cheese Pizza), box of Nuts, box of Cookies (Butterscotch, Ginger, Cornmeal Rosemary, or Lemon Lavender Shortbread Cookies), Cake (Crumb or Pound Cake), and an artisan Rice Cereal Treat (Fruit Blast, Cookies & Cream, or Classic). This is the large size for this container. Container approximately 10 1/4 x 6 x 7 1/2. Finished wrapped design for hand delivery is approximately 19"H x 14"W x 8" D.
NOTE: The artisan Rice Cereal Treat, gourmet Popcorn, Nuts, and all Cookies are made right here in the Dallas area! The Snack Mix, Fudge, and Soda are made in Texas. If you have a preference on flavors, let us know in the Special Instructions section during check out. For shipping, they will be designed lower in the container, shrink-wrapped, and a flatter more durable bow/enhancement will go on top.